Newspaper Rock: Winddancer called a "cultural thief"
Ed Winddancer, 55, changed his name in 1992With his majestic headdress and fearsome warpaint, Ed Winddancer appears to be carrying on the proud traditions of his Native American ancestors--but according to a long-standing enemy, he is nothing but a fraud in feathers. 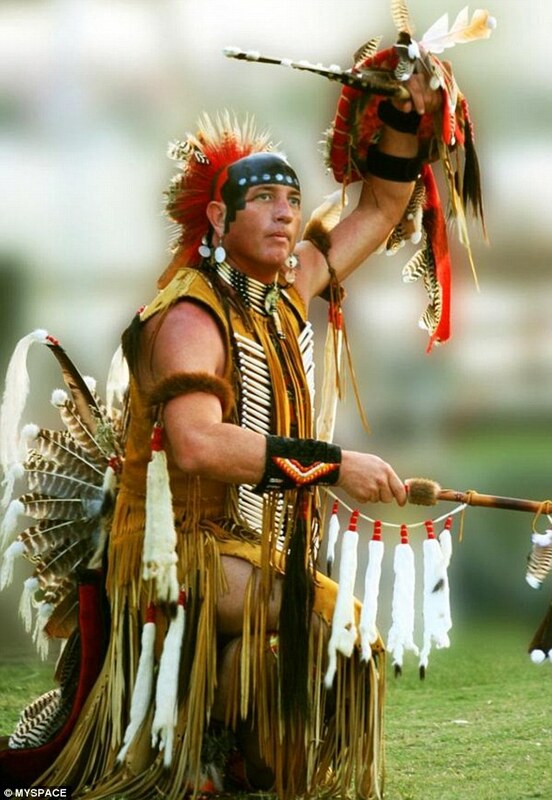 Winddancer, 55, traces his roots to the Nanticoke and Cherokee tribes, and often appears in full dress at heritage festivals to play the flute, regaling crowds with ancient stories. He sells CDs of his music through his MySpace page. However his performances are now often accompanied by the presence of Sal Serbin, 48, who has taken to appearing at Winddancer's gigs holding up signs reading 'Liar' and 'Cultural Thief'. Mr Serbin, from Sarasota, Florida, claims that not only is Winddancer a fraud--but his practices are downright dangerous. He told the Herald-Tribune: 'Our ancestors fought and died to preserve and protect our culture, not for these people to wake up one day, put some feathers in their hair and decide to be Indian. Mr Serbin, has Sioux lineage and says his grandfather fought in the Battle of Little Bighorn in 1876. He said that Winddancer is not alone in his allegedly false claims to be Native American--which is against federal law.Comment: Everything about Winddancer smacks of wannabeism: the made-up name, the Plains-style regalia, the warpaint, the flute music, etc. I'd bet that he has a tiny amount of "Nanticoke and Cherokee" blood at most and knew little about his "roots" until adulthood. But we can't tell how much "blood" Winddancer has from this article. Nor do I know enough about the Nanticoke and Cherokee cultures to say his costume and dance are totally stereotypical. So we can't say definitively that he's a fraud. "Wannabe" is probably a better term than "fraud." There's no evidence that Winddancer is misrepresenting himself. He seems to be stretching his Native heritage to the breaking point, but that isn't necessarily a crime. For more on Indian wannabes, see Top 10 Native Fashion Misappropriations and Mythical Indian = "National Mascot." Let's see his CIB (Certificate of Indian Blood) or tribal enrollment number. If you don't have that, you're not a real NDN. Note that ideas the West considers arbitrarily "evil", like Night and Dark are almost never on the list. The closest is Wolf. Good list of fake name components, Anonymous #2. But it has to include "Hawk" and "Bear." Perhaps "Medicine," "Shadow, and "Cloud" too.